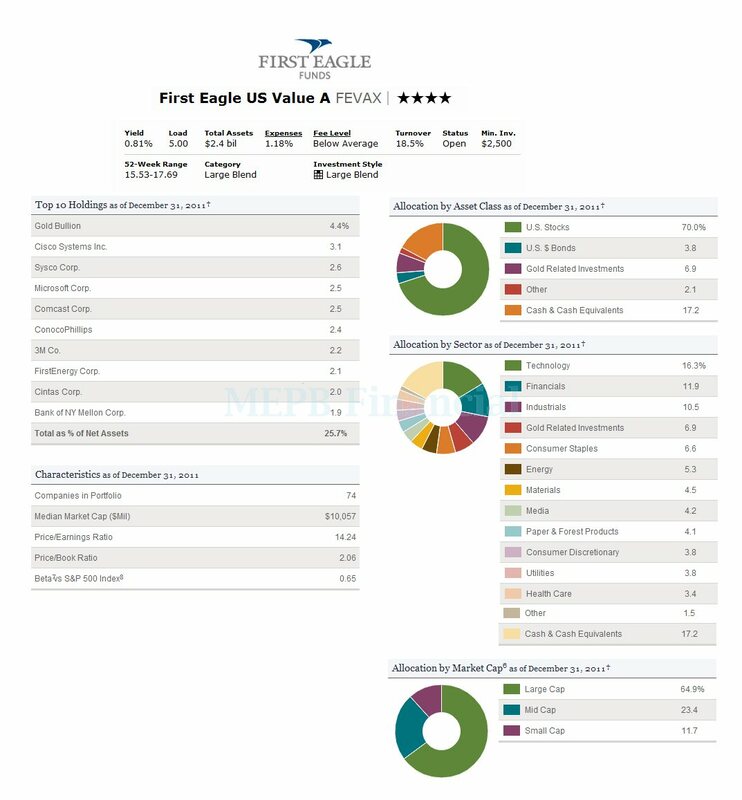 First Eagle US Value fund is one top rated US stock mutual funds. 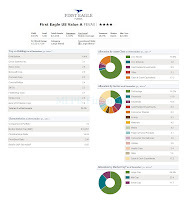 As of January 2012, this large blend stock mutual fund has Gold bullion as its top holding. More fund review can be found as follow. The First Eagle US Value fund seeks long-term capital growth. This US fund mainly invests majority of assets (>80%) in domestic equity and debt securities. It may invest small part of its asset in non-U.S. issuers. This large blend fund may invest in any size company, including large, medium and smaller companies. It may invest in fixed-income securities, short-term debt instruments, gold and other precious metals. This large blend mutual fund has 1.18% annual expense ratio. The total net assets of this fund are $2.37 billion. The 12-month dividend yield is 0.81%. The last dividend was distributed in December 2011 ($0.14). The annual holdings turnover rate as of February 13, 2012 is 18.54%. This fund has 4-star ratings from Morningstar. The management team that manages this fund consists of Matthew McLennan, Abhay Deshpande, Kimball Brooker, Jr., and Matt Lamphier. If you are interested in international large cap, you can check my best international large cap mutual funds post. This FEVAX fund can be purchased from 85 brokerages such as Merrill Lynch, Scottrade Load, JP Morgan, Edward Jones, Schwab Institutional, Morgan Stanley Advisor, Fidelity Retail Funds Network, etc. The initial purchase needed is $2.500 for brokerage account and $1.000 for IRA account. The minimum subsequent investment needed is $100. The 12b1 fee is 0.25% and the front-end sales load fee is 5.00%. Investor can check out the other class of this fund such as FEVCX (Class C) and FEVIX (Institutional Class). The top 10 holdings of this fund represent 25.7% of the total net assets. They are Gold Bullion (4.4%), Cisco Systems Inc (3.1%), Sysco Corp (2.6%), Microsoft Corp (2.5%), Comcast Corp (2.5%), Conoco Phillips (2.4%), 3M Co (2.2%), First Energy Corp (2.1%), Cintas Corp (2.0%) and Bank of NY Mellon Corp (1.9%). The top sectors are Technology (16.3%), Financials (11.9%) and Industrials (10.5%). There are several Investment Risks for investing in this mutual fund such as: Market Risk, Small and Medium-Size Company Risk, Gold Risk, Foreign Investment Risk, and Credit Risk.